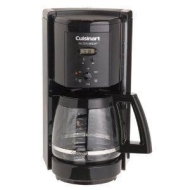 alaTest has collected and analyzed 28 reviews of Cuisinart DCC-1000BK. The average rating for this product is 4.6/5, compared to an average rating of 4.4/5 for other products in the same category for all reviews. Reviewers really like the durability and size. The design and maintenance also get good reviews. We analyzed user and expert ratings, product age and more factors. Compared to other products in the same category the Cuisinart DCC-1000BK is awarded an overall alaScore™ of 84/100 = Very good quality. i don't believe whoever designed this coffeemaker ever used it or it would be back to drawing board !!!! I bought the coffeemaker for home use; I selected this model because it can be programed up to 4 hours instead of 2 before it turns itself off; and the price was reasonable. Had this before, actuall wore it out, and was so happy with it. Had to replace it with same. I use it everyday. Easy to use. I like everything about it. The brand speaks for itself. I only have one minor complaint, the lid to the caraffe is somewhat hard to get back on after washing the caraffe. Coffeemaker fits my needs for every day coffee perfectly. This coffeemaker is the perfect replacement for us. It doesn't take up to much space (compared to our other one) and is easy to program. So nice waking up to a hot cup of coffee! The Cuisinart DCC-1000 is the height of contemporary design, and its performance is pure Cuisinart! Sleekly molded around the new contoured carafe, this stunning coffeemaker is engineered to produce 1 to 12 cups of exceptionally fresh and flavorful coffee. A Programmable Brew Time feature wakes you with the wonderful smell of fresh coffee, and automatically turns the coffeemaker off when you want it off. There's simply no better way to start your day. Delicious coffee, yours from Cuisinart.